Based locally, we are able to provide you the best rates on hotels and apartments in Banff. Opposite are a selection of Banff hotels which we think you will like. 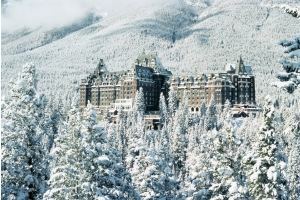 Click on any of the Banff hotel names for more information on that hotel. Contact us with your preferences and we will find a suitable Banff hotel for you as not all Banff accommodations are listed. Take advantage of our following early-bird promotions! 4th night FREE for a limited time. Rates, promotions and availability subject to change. On June 2, 2008. Banff became the first municipality in Canada to introduce an all-hybrid electric transit fleet. These new Roam buses are friendly to the environment, and they look special too: they are wrapped in authentic Banff National Park wildlife imagery. Each bus features a unique back-country view of grizzlies, elk, goats and wolves. Most hotels are serviced by the regular Roam Transit system, and some hotels offer free passes with your stay.